We all want to enjoy comfortable cooling in our homes, which means that we need our air conditioning systems to work consistently. 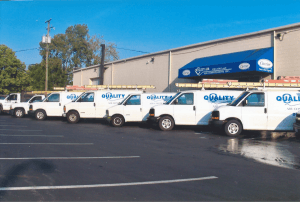 When you need any kind of air conditioning repair in Columbus make sure that you call Quality Air Heating and Air Conditioning. We have years of experience working on all different kinds of air conditioning problems and wanted to give our customers a few ways that they might be able to prevent AC repairs. If your AC has to constantly run to keep your home comfortable, it is subject to increased wear and tear, which can lead to repairs and even early replacement. Good insulation in your home can help keep the temperature in your home consistent, which means your air conditioning system will need to run less often. A well insulated home will also help your AC cool evenly, since you won’t have rooms that are losing a lot of cooling to the outside. When your contractor is installing your new system, the effectiveness of your insulation is one of the many factors they will take into account when finding the right capacity system for your home. The more effective your insulation, the smaller a system you need. A properly sized system is essential to avoid problems like short cycling and uneven cooling. Of course, another terrific way to potentially reduce the need for repair is to get your air conditioning system regularly inspected by a professional technician. During regular maintenance visits your AC professional will look for small problems and issues that could eventually turn into larger, more costly repairs. By fixing those problems early you might be able to keep them from causing issues in the future. When you need air conditioning repair in Columbus, make sure that you call the friendly experts at Quality Air Heating and Air Conditioning. We have years of experience working with all different types and brands of systems.